We have a situation to use WebView to show web site contents in your application. iOS prepares some ways to show web page. Apple prohibited to show some web pages, but web based game, service faq etc… there are a lot of cases we want to use webview in iOS apps. if you want to customize, please use WKWebView, if you don’t need customize, SFSafariViewController might be better. 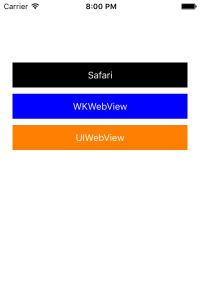 The difference is xxView, UIView base, but SFSafariViewController is UIViewController base, modal like. I heard UIWebView in iOS9 is a bit unstable.